FOSS | Yet another blog !!!! Hello all, I was facing a trouble with the graphic driver in Linux for the past few months. When I did the installation as per the previous post in my blog, there are some issues like missing library packages, unable to install the package etc,. After searching the net for a while, I found out the following solution for the graphic driver problems which will completely turn off the graphic card while we work in Linux based systems. This is the best way I found out by which I can work on Linux for hours together with out any battery drain or over heating problems. In the following steps we will be disabling the graphic card temporarily by making changes in the kernel files. For that just follow the instructions given here. 1) The changes which we will make to the kernel needs root access, so open a terminal as a root user. 2) Navigate to the vgaswitcheroo folder placed in the kernel. 3) For turning off the graphic card just change the value of the switch file by executing the following command in the terminal as a root. Now wait for a few minutes and see the battery status. You can see the change in the amount of backup time. Now .bashrc file will open and just copy the following to the .bashrc file. Now, just save the file and exit. The thing what you did just now is you have added the above line to the .bashrc file which will be loaded on the system boot-up. This will directly execute the above command when the system files get loaded. Just please give me the feedback regarding the post in the comments. Doing good is a part of our code. Mozilla is one of the most leading open source organizations in the world now. Since a lot of people works for Mozilla by fixing bugs and implementing new features. Since people use multiple platforms for this, here I will provide a small guide through which you can install the source code for Mozilla on multi platforms and how can you start your first contributions. As a Mozillian I prefer any one to start their open source contribution with Mozilla. 2 GB RAM and lot’s of free space in it. For debug and builds: at least 8 GB of free space. If the above command doesn’t work then proceed for one of the following based on the Operating System you are using. With the help of the following command you can download and install the prerequisites required for Mozilla build in Ubuntu (as root). With the help of the following command you can download and install the prerequisites required for Mozilla build in Debian(as root). On Debian Squeeze, you need to install yasm-1.x from the squeez backports. You can also get the mercurial bundle if you need the compatibility with an existing mercurial repository. sudo yum group mark install "X Software Development"
After doing these depending on the Operating system you use, you can proceed for building Mozilla source. Once after you finish the installation of the prerequisites required for the Mozilla build you can continue with the build process. Build process generally goes with the downloading and installing through the mozilla.hg file. You can download the latest mozilla bundle from here. Once you have downloaded the mozilla bundle follow the steps given below to install the source code. 2) Unbundle the mozilla.hg bundle in the created folder. 3) Create a hgrc file in /mozilla-central/.hg/ , in this file we will be adding the path to the main repository so that we can pull the latest changes and update the bundle before we can start the build process. in that file insert the following lines and save the file. 4) Enter the following command in the terminal, so that it will pull all the latest changes to the code. and after that the next command to apply the changes to the repository file. 5) Once after the changes are applied you can start the build process with the help of the following command. Once you see this in your terminal you are ready to start with your first contribution. Now that you have completed the build and you are ready to start fixing a bug. Bug fixing is basically where you need to go through the code and find the part of code that is responsible for the bug. For this you can take the help of the Mozillans in Internet Relay Chat (IRC). You can follow steps for getting connected to Mozilla IRC and clarify your doubts regarding the bug which you got assigned to you. If you are using Mozilla Firefox as your browser it got an extension for IRC called Chatzilla. Chatzilla is basically an IRC client developed by Mozilla. If not that you can use different clients such as Mibbit or IRCCloud as per your convenience. After opening the chat client, for connecting to the Mozilla server just type the following in the IRC client. This is where you can start asking any questions related to bugs or in general also. Depending on the bug which you took and the availability of the mentor you can go and directly talk to him or you can ask any one there. There are a lot of people in Mozilla who are ready to help you at any point of time. 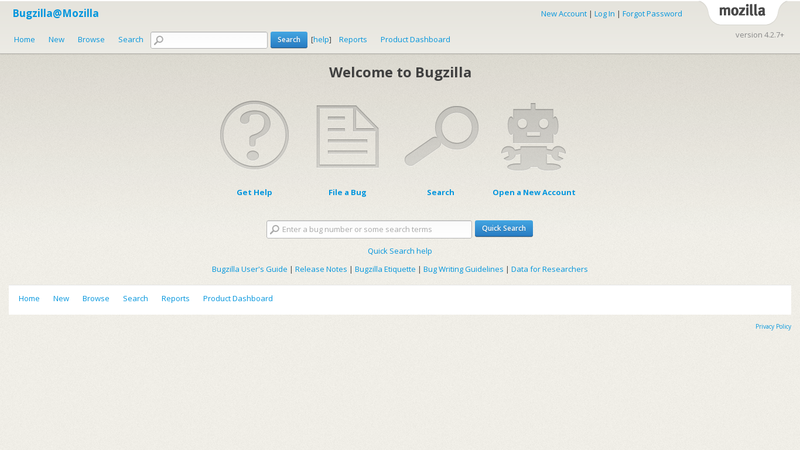 Once you are ready with the build you can go to bugzilla for searching for bugs. As for a beginner it is recommended to start with minor or trivial bugs. You can search for bugs using bugzilla and once you found out a bug just tell in the bug comments saying that you are interested in working for this bug. After some time you will get that bug assigned to you. Once you are done with selecting a bug, you can go and ask any help regarding the bug in #introduction on IRC. While fixing a bug in Mozilla you have to find out a particular function which you need to modify. In that case you can use mxr or dxr. Using these two sites you can search for a file or a particular word or a module. After you have fixed the bug, you have to make the patch. For making the patch you have to use mercurial. Mercurial is used to create patch for the bug which you have fixed. Patch is one which gives you the changed you made to the code. Patch makes the mentor of the bug to review the changes and test it. For this you need to add the following lines to the hgrc file which you have created previously for giving a path to the Mozilla central repository. This helps you to create a perfect patch for the bug which you have fixed. Once after you attach the patch to the bug then you can wait until the mentor reviews the patch. Now I am going to explain a part of it in which I went to Diu and Daman (Union Territory) with my cousins. It was an amazing place, but the time we went is not suitable for that spot. Actually it is a place which is to be visited during Rainy Season. It took around four hours to reach from Mumbai to Silvassa. Silvassa is the capital of Diu and Daman. We reached Silvassa around 10:00 in the morning. First we thought of going to Lion Safari. I was so excited that we are going for a Lion Safari. But after going there only I came to know that it is not a lion safari. After going there I was surprised because it was only one lion in the park. I thought it would be boring even for the remaining part also. But my calculations went wrong. After the lion safari we planned to visit the Damanganga dam . The way which led to the reservoir was amazing. It was a ghat road with lots of greenery. In the midway we stopped to have some pics with my cousins. 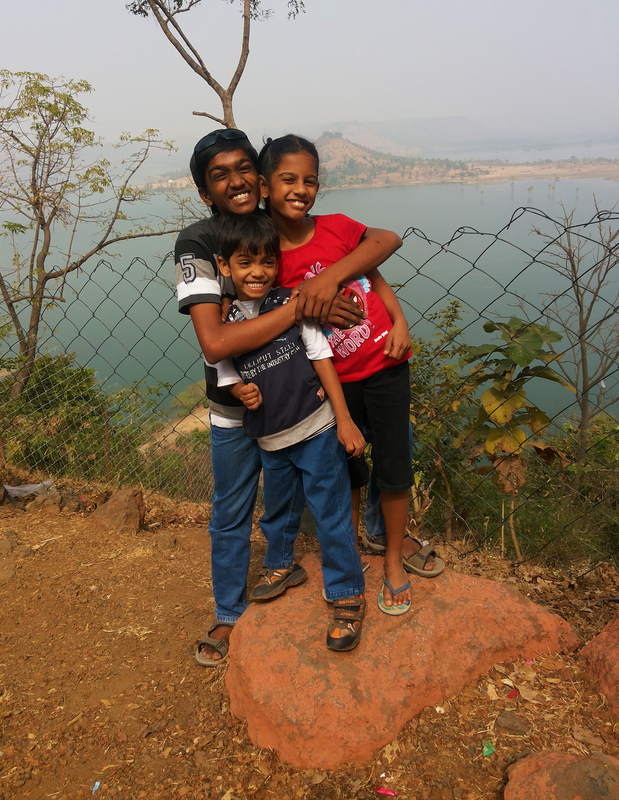 One of my fav pics taken there was with my sister and brother (small kids). I got enough comments for that particular pic. 😛 After reaching there we thought of going for boating which was through the reservoir. We went all the way from one end of the reservoir to the other end of the reservoir. The place was truly amazing. It took around one hour to come back. In the mean while we had some snaps also. But one thing we missed is the Tarpa Festival. After that we thought of going to the deer park. After a long waiting for around two hours we got our turn finally to go and visit some deer’s. The deer park was truly awesome. It was a safari of about 20 min. All the way through the way we travelled it was full of deer’s only. I was lucky enough to touch a deer which was passing by from our vehicle. But problem is the driver didn’t give enough time to take good pics of the deer’s. But the time we spent in the deer park was like heaven for me because it was so pleasant and quite there. It was an amazing experience when I was in air for the first time with a parachute on my back. It will be about 200 feet I was from the ground level in the air. I was shouting like hell coz I was so excited. One thing which I was surprised of the beach was the water went back around 500 ft during the morning time. Two more days we had fun covering the places there nearby including Surat. It was one of my best trips till now.